The $27 billion specialty chemicals company has barely managed positive returns in the last three years. A stagnating top line only explains part of the neutral performance, however. 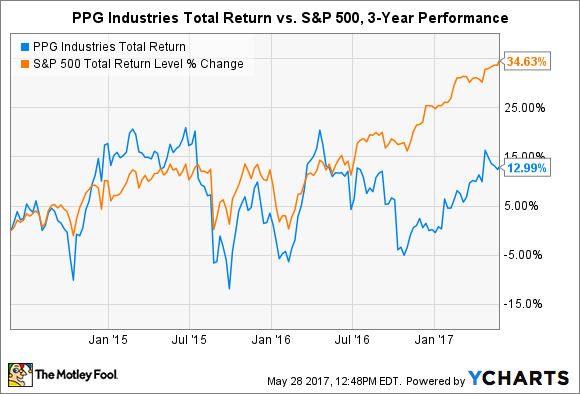 Despite being a dependable blue-chip stock for long-term investors, paints and coatings leader PPG Industries (NYSE:PPG) has struggled to create value for investors in the last three years. Even with dividends included, the stock has only managed a 13% gain. That's almost one-third of the returns of the S&P 500 in the same period -- and includes a nearly 6% reduction in the number of shares outstanding. Wall Street isn't quite sure what to make of PPG Industries stock. While the inability to grow revenue in each of the last three years plays a significant role, several other important factors are contributing to a ho-hum performance. Here are a few things investors should consider and where the stock is headed in the long term. The single biggest factor -- and the easiest to draw attention to -- is a lack of sales growth. There has been virtually no increase in the last three years. Investors who poured over the income statement from the first quarter of 2017 would have been hard-pressed to spot any differences from the year-ago period. Several metrics were identical to the year-ago period, while others only differed by several million dollars -- hardly a rounding error for a $27 billion company. PPG Industries is keenly aware that its mixed financial achievements are sowing confusion among Wall Street analysts, but that hasn't made the path forward any less uncertain. Management has been executing on a multiyear strategy to divest non-core assets and focus on paints, coatings, and specialty chemicals. The efforts include the just-announced $545 million sale of the last of its fiberglass business, among several other sales in recent years. To date, most cash generated from asset sales and operations has been used to just repurchase shares, but management is attempting to make a huge splash to create long-term value. Unfortunately, things aren't going so well. Three separate attempts to purchase Dutch peer Akzo Nobel have been rejected this year, with the most recent offer weighing in at a hefty $29 billion. A potential merger of the world's two leading coatings innovators would create a behemoth with 21% market share. PPG Total Return Price data by YCharts. There are hurdles spanning regulatory and political (Dutch companies have an unprecedented legal authority to change their structures on a whim to dodge unwanted approaches), but the largest obstacle remains the firm belief that the most recent offer doesn't adequately value the target company's plans to spin off its specialty chemicals unit. The business generated one-third of Akzo Nobel's sales and profits in 2016. That threatens to push up the asking price quite a bit more, which would erode the value of a potential deal for PPG Industries shareholders. Then again, there doesn't appear to be a plan B, and given mounting pressure on the stock, management may feel the need to keep increasing its bid. Although continued pressure from PPG Industries has begun to weaken the resolve of Akzo Nobel's management, a potential merger still faces long odds. If management fails to close the megadeal, then it will be forced back to the drawing board to come up with an answer for creating long-term growth. Right now, Wall Street doesn't appear to be holding its breath.